Can the thinking of leaders be shifted to change the world? Jim Kouzes & Barry Posner agree with Dr. Cheryl Lentz in new refractive thinker book that answers this question. Dr. Cheryl Lentz has asked the question for years, "Can we change the way leaders think?" Her philosophy is simple, "I critically think to be, I refractively think to change the world." It was this philosophy that inspired her to create the Refractive Thinker® series of books that allows for PhD’s to co-author and share their refractive thinking methodology. "Will this shift the future of our global leaders?" Dr. Lentz can’t answer for certain, but her next book in this series has the endorsement of two leadership greats - Jim Kouzes and Barry Posner, best-selling authors of The Leadership Challenge. Dr. Lentz today announced that these best-selling authors have agreed to write the foreword for the next Refractive Thinker which focuses on Research Methodology. The goal of the Refractive Thinker book series is to share another glimpse into the scholarly works of the authors who participate. "There are unique and innovative applications of research methods that are often hidden in the works of doctoral colleagues. They spend significant time in preparing their doctoral thesis and through the Refractive Thinker I am proud to be able to shine a light on their works. The authors I highlight dare not to just think outside the box, instead they believe the box continues to evolve and shift into exploring new ways to construct a box such as applicable methods or perhaps elimination of the traditional box completely," said Dr. Cheryl Lentz, founder of the Lentz Leadership Institute. Dr. Lentz is known as an innovative pioneer in the academic world having published eight books in the series. She has dedicated a significant amount of time to educating those in academia as well as in business on the need to push beyond the traditional boundaries of thinking and critical thinking. Instead she advocates moving beyond the mere reflection and evaluation, and challenges the very boundaries of the constructs itself. "The goal of this series is not definition but application and unique application of various methods and designs. These scholars are those on the cutting edge of research, finding new ways of application in the how to conduct research," said Jim Jim Kouzes, Leavey School of Business, Santa Clara University and co-author of The Leadership Challenge. "Each of these authors has a unique twist to their research, what they did and why they did it in a particular way. We know that academia is rather traditional and change comes slowly. These doctors took a bit of a risk to not only forge ahead with new research but new ways of conducting research that challenges the status quo." "One of the goals is to have the reader learn from those that have gone before them, to shorten the reader’s learning curve as contributions are made to the greater body of knowledge within research. These authors share their thoughts on what they did and why, and what they recommend doing different for the reader in following their path. These authors do not only ask why, they ask why not? Think Einstein. If thinking is inside the box, and critical thinking is outside the box, refractive thinking is asking the question of what lies beyond the box," Barry Posner, Leavey School of Business, Santa Clara University and co-author of The Leadership Challenge. Dr. Lentz is proud to have such icons in corporate leadership endorsing the next compilation book. She believes this provides validation that respected leaders recognize refractive thinking is what will solve challenges in the world. If thinking is inside the box, and critical thinking is outside the box, refractive thinking is beyond the box. The Refractive Thinker® series provides doctoral scholars with a collaborative opportunity to promote and publish their work in a peer reviewed publication, which meets the university standard. Our goal is to provide an affordable outlet for scholars that supports the tremendous need for dynanmic dialogue and innovation while providing an additional clout and recognition for each contributing author. 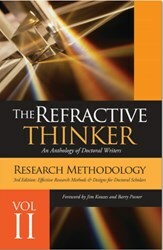 Unlike most academic books that merely define research, The Refractive Thinker offers unique application of research methodologies from the perspective of multiple authors – each offering a chapter based on their specific expertise. To learn more about the book contact Sheila Stewart at 303-378-2022 cell or sstewart(at)sheilastewartpr(dot)com or go to http://www.refractivethinker.com.